When approached with the idea of creating a museum in his honor, Roger Eugene Maris (September 10, 1934 – December 14, 1985) – who hit a Major League Baseball record 61 home runs during the 1961 season for the New York Yankees, breaking Babe Ruth’s single-season record of 60 home runs in 1927 – declined. An incredibly humble man, he eventually relented but requested that the museum be “put where people will see it.” He also requested that the museum be open to the public free of charge. The Roger Maris Museum opened in Fargo, North Dakota – Roger’s hometown – in 1984, and true to Roger’s wishes, it is visible, accessible, and free. Located in the Roger Maris Wing near the Aquarium Court at West Acres Shopping Center, the glass-enclosed museum enables visitors to re-live Roger’s legendary life. More than 7,000,000 people visit West Acres every year, and while museum officials don’t track museum attendees, there is almost always someone viewing the memorabilia. A video room for watching historic footage while sitting on actual Yankee Stadium seats from the Maris era. A replica of Roger’s Yankee Stadium monument. A replica of Roger’s 1961 locker. Displays and artifacts from Roger’s youth and Major League playing days. If you have questions about visiting the Roger Maris Museum, contact us. The 1961 single-season home run record stood for 37 years, longer than the record Maris broke of Babe Ruth’s 60 homers in 1927. The Baseball City Hall of Fame, a self-proclaimed alternative organization to honor baseball legends the Hall of Fame has overlooked, has inducted Roger Maris and honors him among the greatest ever to play the game. 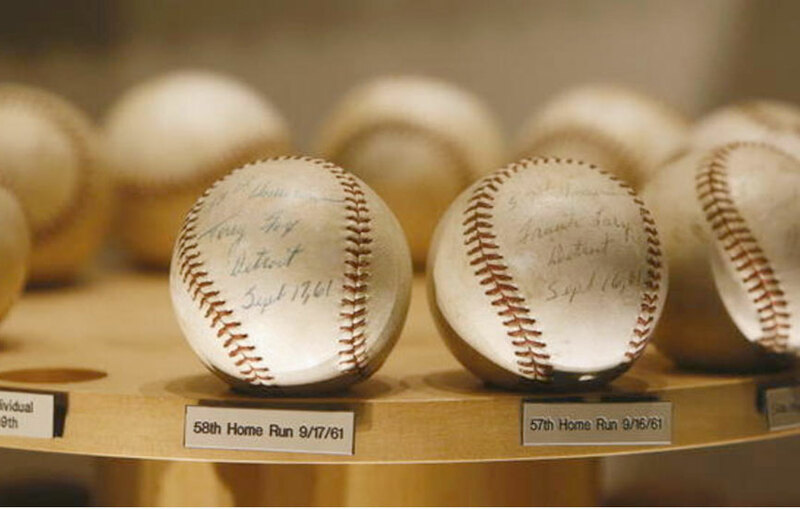 In a nod to the magnitude of Roger’s accomplishments, the National Baseball Hall of Fame includes Roger Maris artifacts. Permanently at Cooperstown are the bat Roger used to belt number 61, along with the immortalized baseball he hit off Tracy Stallard on October 1, 1961. His 1961 Yankees home jersey is also on display. The Yankees retired #9, Maris’ uniform number, on July 21, 1984. A new Roger Maris plaque was also dedicated in Monument Park at Yankee Stadium. The plaque calls Maris, “A great player and author of one of the most remarkable chapters in the history of major league baseball.” Maris participated in the ceremony wearing a Yankee number 9 uniform. Roger was born September 10, 1934, in Hibbing, Minnesota, moving with his family to Fargo when he was 10. After his sophomore year at Fargo High School, Roger began attending Shanley High School in Fargo. It was there that he began an incredible string of sports successes. Beginning in 1950, he competed in football, basketball, and track. Former Shanley coach Sid Cichy once said that Maris was “obviously a gifted athlete. He could do everything, and he did do some pretty unusual things.” One of those was scoring four touchdowns on returns (kick, punt, interception) in one game, a high school football record that still stands. Roger’s skills as a high school running back even earned him a scholarship to the famed Oklahoma University football program, an opportunity he initially accepted but eventually passed up to remain in Fargo. Roger began his minor league career in the Class C Northern League. In 1953, just a year out of high school, he was recruited by the Cleveland organization and attended spring training in Daytona Beach, Florida. Despite being told by the organization’s farm club director that, “We never let a boy play in his hometown,” Roger persisted and eventually was wearing a Fargo-Moorhead Chicks uniform. Roger’s first season, where he batted .325 with nine home runs and 13 triples, earned him the league’s Rookie of the Year Award. His value as a player established, Roger quickly moved on to the Class B Three-Eye League in Keokuk, Iowa, for the 1954 season. Class AA Tulsa (Oklahoma) of the Texas League quickly followed, and he also played in Tulsa and Reading, Pennsylvania. His stay at Indianapolis, Indiana, however, solidified his potential as a major leaguer. In that 1956 season, Roger batted .293, hit 17 homers, drove in 75 runs, and helped carry the club to the Little World Series championship. Roger’s experience in the minor leagues led him to make a personal change. Although his family’s name was “Maras,” he changed his name to “Maris” in 1955 to avoid unflattering chants from fans who were bent on rhyming his last name. The Cleveland organization had signed Maris in 1953 for $15,000 plus a $10,000 bonus if he made it to the majors. His performance made that look like a steal, and he began the 1957 season with the Cleveland Indians in the big leagues. Roger was traded to the Kansas City in the off-season, and enjoyed a stellar season in 1958 before being traded to New York.